Vatican City, Oct 29, 2018 CNA.- The fifteenth ordinary general session of the Synod of Bishops closed on Saturday. After a long afternoon of voting by the synod fathers, a final document was approved, mostly addressing the topics of young people, faith, and vocational discernment. After nearly a year’s preparation, and more than three weeks of synodal sessions, the Oct. 27 document had been keenly anticipated by Church leaders and the media. But most of the anticipation was about how the synod would address topics only tangentially linked to the synod’s official program. The three most prominent of these were the clerical sexual abuse crises still engulfing the Church in some parts of the world; the ways the Church speaks about human sexuality, and especially homosexuality; the concept of “synodality” in the exercise of the Church’s teaching and governance. The immediate run-up to the synod was dominated by the serious sexual abuse crises that have broken out across the Church. 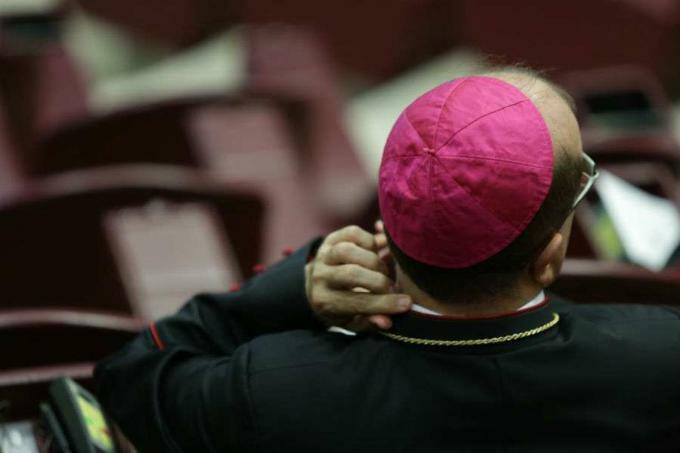 In Chile, seven bishops have been removed from office since April, and more are expected to go. In Germany, a damning internal report on clerical abuse was recently leaked, and in Poland victims of historical abuse are coming forward in growing numbers. In the U.S., the spectacular fall of Archbishop Theodore McCarrick was elevated from a national to international scandal by a former apostolic nuncio, Archbishop Carlo Maria Vigano. In an explosive series of public “testimonies,” Vigano has accused the Vatican hierarchy under the past three popes of ignoring or dismissing allegations against the former cardinal, and of aiding his advancement and influence in the Church. Bishops from across the world called for the synod to be delayed or repurposed to tackle the growing crisis of sexual abuse. Once it began, many synod fathers raised the issue of abuse and insisted that it be addressed on the floor of the hall and in the final document. Others argued that the synod had been called to consider other important issues, and should not be completely derailed from its intended purpose by the sexual abuse crisis. In a partial response to calls for the synod to be postponed or cancelled, Pope Francis announced a February 2019 meeting of the heads of the world’s bishops’ conferences to treat the matter of abuse specifically. Although not a holistic treatment of the scandals or an authoritative answer to them, the attempt to acknowledge the problem in some meaningful way while still grasping for a means of formulating a credible response reflects a problem the US bishops will likely face when they gather for the USCCB’s general session in Baltimore in November. Before and during the synod concerted effort was made to insert the language of the gay rights movement, especially the acronym LGBT, into synod documents, and by extension into the official vocabulary of the Church. Although it was not included in the report presented by young people attending the synod’s pre-meeting in March, the term “LGBT” made it into the synod’s working document - the instrumentum laboris - apparently at the initiative of the synod’s permanent secretariat, led by Cardinal Lorenzo Baldisseri. While it seemed to be at most a secondary concern for those actually attending the synod, considerable media pressure built up around the issue, thanks in large part to concerted efforts by outside groups and prominent campaigners in favor of a change to the Church’s teaching on sexual morals. Many of the synod fathers, most prominently Cardinal Wilfred Napier and Archbishop Charles Chaput, criticized efforts to advance distinctly modern and Western attitudes on human sexuality in the synod’s documents. Those bishops noted the Church teaches that the common dignity of humanity comes from being created in God’s image, and that the dignity of each person in the Church is rooted in baptism. Elevating sexual desire or so-called “gender self-identification” to defining human characteristics, the bishops said, mis-locates the source of our humanity in ourselves, and not in God. Some synod watchers expressed concern at what they saw as a concerted effort to import secular identity politics into the synod and relativize the authority of Church teaching. Several observers in Rome expressed concern that adopting the language of the LGBT movement in a “dialogue” about sexuality would, essentially, frame the conversation in way that excludes the Church’s actual teaching. The synod’s final document made no mention of “LGBT persons,” Catholic or otherwise, and called it “reductive” to define a person’s identity by their sexual orientation. Jesuit priest Fr. James Martin called the document a “retreat” on the Church’s ministry to gay people. On the other hand, while stressing the universal and unqualified love of God for all people and condemning sexual discrimination and violence, the synod’s final document also stressed the need for “accompaniment” for “homosexual persons” in the Church as they “follow with freedom and responsibility their baptismal call.” This language has been taken up by some activists. Francis DeBernardo, author of the post and executive director of New Ways Ministry, has previously said that so-called gender transitions help people “become closer to God.” The organization has been the subject of numerous corrections and warnings by Church authorities over the years. Some in the Church, both in favor and against the possibility, have suggested that following the synod some dioceses in different countries might adopt increasingly divergent means of “accompaniment,” ranging from authentically pastoral presentations of Church teaching on sexuality and human dignity, to effective public acceptance of homosexual unions. How far these different forms of “accompaniment” might be allowed to develop could hinge on whether the pope decides to develop the theme further in a post-synodal apostolic exhortation, or simply adopt the synod’s report as his own. It may also depend on what is intended by the document’s call for a more “synodal” Church. Although not addressed in the Instrumentum laboris or raised by the synod fathers in their deliberations, the concept of “synodality” emerged as a surprise focus in the final document as a draft was circulated Oct. 25-26. Pope Francis has previously called synodality a “constitutive dimension” of the Church, but there is little common understanding among bishops regarding what exactly the word means. The synod text calls synodality it a remedy for clericalism - which some have blamed for the sexual abuse crisis – and a blueprint for creating a more “participatory and co-responsible” Church. Although there is broad consensus among bishops in favor of a more engaged, responsive, and interactive hierarchy, many of the synod fathers were caught off guard by the inclusion of the topic in a document purportedly focused on youth. The text says that one of the results of the synod sessions has been emergence of “some fundamental features of a synodal style” which the wider Church is called to adopt. Some of the synod’s participants found this statement confusing, even ironic. One priest attached to a delegation from an English-speaking country told CNA that the “synodal style” highlighted by the document was not immediately clear. While some synod observers and members were left confused by the sudden emphasis on synodality, others had a more pointed reaction. Bishops from several different anglophone countries, including England, are reported to have denounced the language, fearing it is a step towards a parliamentary, Protestant approach to Church governance and teaching authority - something which has severely damaged the Anglican Communion in recent decades. Another source of contention was the explicit reference by the final document to the Instrumentum laboris. The two texts are to be read, so the final report says, in “continuity” with one another. One Vatican official who attended most of the sessions told CNA that some at the synod’s General Secretariat saw this as an opportunity. “I think more than a few are treating this as a way of eating their cake and having it too,” the official told CNA. Historically, synodal documents have not been given much weight, a fact Francis acknowledged at the beginning of this synod. The role of the synod is primarily to discuss an issue and offer the pope the fruits of that discussion. It is the pope, in a later apostolic exhortation, who traditionally produces the magisterial document. In his recent reform of the Synod of Bishops, Francis explicitly noted his option to adopt the final synodal document as his own, leading many to speculate that this was his immediate intention. It is not yet certain whether Francis will add his signature to this synod’s final document or offer his own version at a later date. Many bishops, discussing synodality, pointed out that the pope’s teaching authority in the Church is unique, and many bishops raised concerns about anything that might seem to degrade that authority. At the same time, some synod fathers leave Rome wondering if their voices were actually heard during the meeting. As Pope Francis calls for a listening Church, some bishops will be waiting closely to see just what he heard during their meeting.